Aaniin - Connect. Share. Grow. 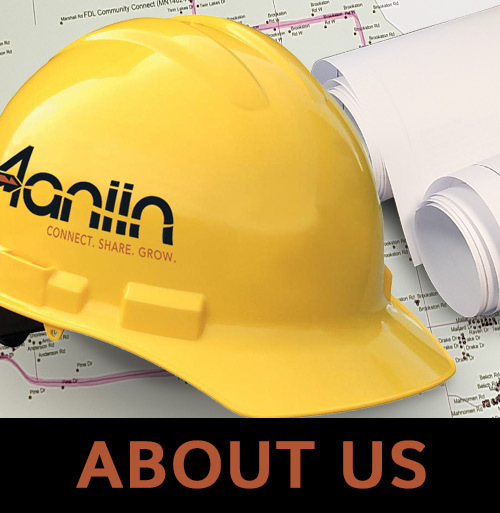 Aaniin is the brand name for the Fond du Lac Communications Fiber-to-the-Home project. You'll be seeing this logo around the community on yard signs, crew vehicles, door hangers, and here on our new website! Aaniin offers Fiber Internet, Telephone, and eventually Video; with bundle options available soon. Internet speeds will start at 50 megabits and will go up to 1 gigabit! This will be one of the fastest internet connections in our region. Most of the Fond du Lac reservation is underserved by internet host services, with many residents relying on Satellite or Dial-Up internet. This is not sufficient in today's internet-based economy and lifestyle. Aaniin is comprised of three central offices in each of the 3 districts that make up the Fond du Lac reservation; Brookston, Cloquet and Sawyer. Each central office provides fiber internet services to the residences and/or businesses in its service area. This project exists because of grant funding from our partners such as the USDA, MN DEED, and HUD and with an internal investment from the Fond du Lac Reservation Business Committee. The Story of Aaniin, the word. Before flashlights were in common use, Anishinaabek hunters would go out hunting at night carrying lanterns. There were other people out walking at night also carrying lanterns, because traveling on foot was the mode of transportation. So, a person walking in the woods at night could be either a hunter or a non-hunter pedestrian. The pedestrians did not want to be mistaken for a deer and shot at, so if they heard a noise, crackling of wood underfoot, anything unusual, they swung their lanterns back and forth and hollered, “AANIIN !” (I AM!) That way, if it was a hunter, the hunter would know that there was a person, not an animal, there in the woods, and not fire at them.